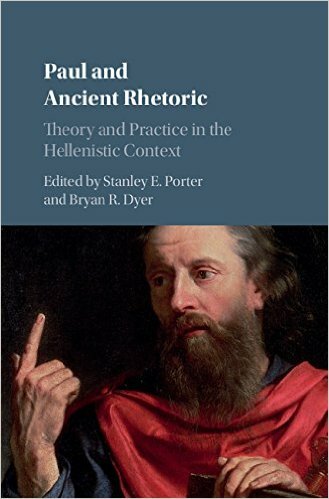 One of our contributors, along with a friend and colleague Bryan Dyer, has co-edited another book, Paul and Ancient Rhetoric: Theory and Practice in the Hellenistic Context (CUP, 2016). It contains a collection of 13 essays on Paul and rhetoric, surrounding the question of whether or not Paul was an ancient rhetor, and what exactly rhetoric in the Hellenistic period was. The list of contributors is quite broad, but one distinctive contributor is Carl Joachim Classen, who unfortunately passed away before the book was published. The editors initially approached Classen about translating one of his recent essays into English, which he was delighted to do. He passed away, however, before the translation was complete, but a friend, Linda Archibald, was able to complete the task for inclusion in this book. The essays all contribute in various ways to the discussion of Paul and rhetoric, including summaries of major issues in play, delineations of the types of discussions that are being had, and identifying further ways to move the discussion forward. Anyone interested in Paul and ancient rhetoric would do well to pick up a copy. 1. Can the theory of rhetoric help us to understand the New Testament, and in particular the letters of Paul? This entry was posted in book reviews, publications and tagged Paul and Ancient Rhetoric, Pauline studies, rhetoric, rhetorical criticism. Bookmark the permalink.